← Why the recent silence on Hynd’s Blog? Bristol City Council has committed to go fossil fuel free! Or, more specifically, to not knowingly invest funds into companies whose primary business is fossil fuel extraction. Despite the fact that Bristol City Council, to the best of my knowledge, doesn’t currently hold any direct investments in fossil fuels anyway is beside the point. The entrenching of an ethical investment policy by a public institution is more about the potential to raise people’s awareness as it about ensuring that the Council will not fund the industries that are, at least in part, responsible for the dangers facing us and our planet due to climate change. In short, I think this news is huge and really exciting. And yet strangely the up-take of this news has been limited. 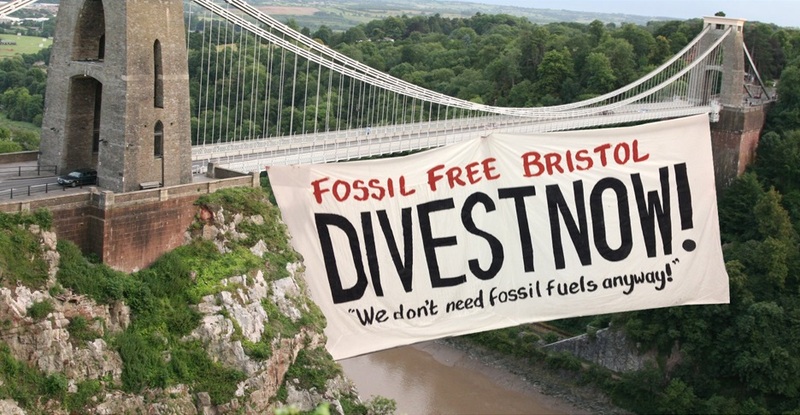 Bristol’s Mayor, George Ferguson, tweeted it to his 27,000 followers, there was a mention in passing in the Guardian and the campaign group pushing for fossil fuel disinvestment wrote a short blog! That combined with an excited text message from my friend (incidentally I love that I have friends who get excited about fossil fuel disinvestment) seems to be the only ripples this news has had. Even Bristol Greens, who played a significant part in securing this, seemed to be oddly quiet having published a general article on disinvestment last Friday that makes no mention of this exciting news coming from Bristol! I think it only fair that a hat tip goes to Green Party Cllr Charlie Bolton who tabled a question at January’s member’s forum that led to the amendment of Bristol County Council’s ‘Ethical Investment Policy’. Quakers are once again leading the way showing the role religious institutions can play in ethical investment, as Bristol is for local authorities. As I say, I think these are some of the first pretty exciting yet tentative steps in tackling the entrenched carbon intensive norm that currently operates within our society. You can read more about Quaker’s disinvestment here and more about Bristol’s disinvestment here. Brillinat news from Bristol. Now Greens in Stroud need to ensure our Council does the same. Steve Hynd having an effect already! I wish I could claim credit but sadly not…this one is down to cllrs, officers and (of course) the mayor!